….If you start with a great bird! So go get yourself a good, pastured, local chicken, some nice salad greens, and perhaps some rice. With very little work, you’ll have a tasty dinner! 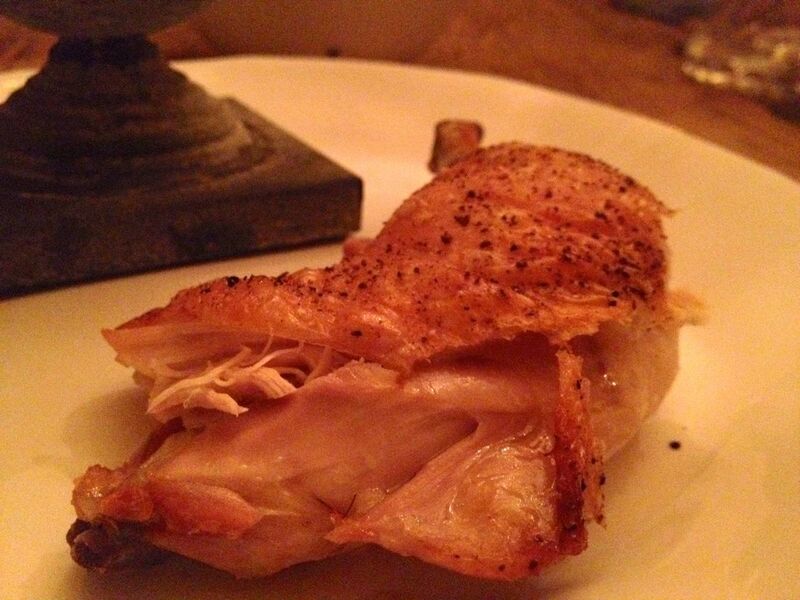 The chicken in this photo is from the Good Farm on Martha’s Vineyard, raised by poultry farmer Jefferson Munroe. To those who live on or visit MV, it is available at Cronig’s, at the farmers’ market, or on Thursdays from 4-6 PM at the Scottish Bakehouse. The skin dries and crisps up real nice. The flesh is seasoned throughout, a result of the brining process. There are no herbs, but the chicken is flavorful as is. Using a sharp knife or kitchen sheers, cut the back bone out of your chicken, and remove any excess skin or fat. Breast side up, press down hard on the chicken breasts to crack the ribs, so the chicken will lie flat. You have just butterflied the chicken. Put the chicken in a gallon ziplock plastic bag. Mix the water, salt and brown sugar. The more you use the sweeter the chicken will be. Note: This salt-water ratio is good for an hour or less brining time! With more time, use less salt. Pour the brine into the bag with the chicken, close, and let sit for one hour, at room temperature. Note: Because this is a short brine, it can sit out, so you eliminate the step of pulling it out of the fridge thirty minutes before roasting to let it come to room temp. 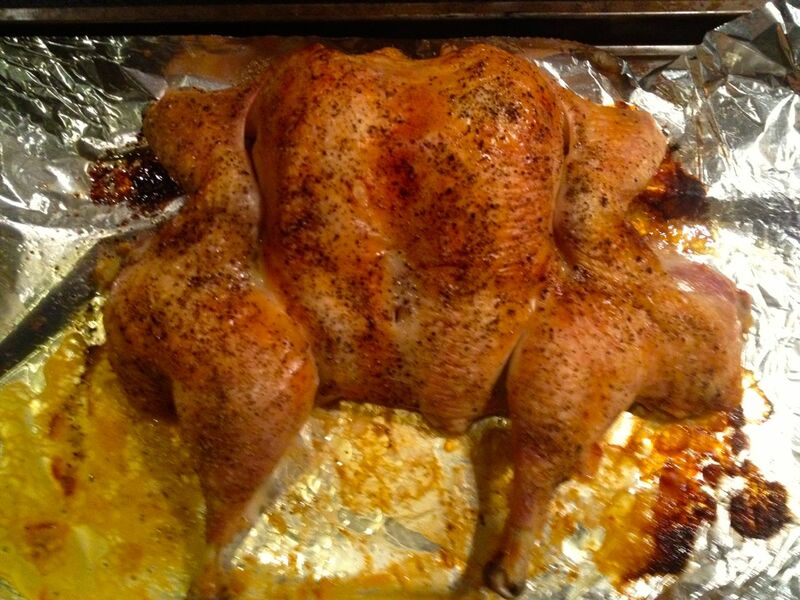 Remove the chicken from the bag, Put the chicken on a baking sheet with tinfoil. Pat the chicken dry, and grind some pepper on top. Roast, uncovered, for 50 to 60 minutes. It is done when juices are goosing out and the skin is golden brown and crispy. I enjoyed this chicken with North Tabor Farm Greens, brown rice, and some homemade pumpkin chutney. And of course, with good company.